The Hague : A stolen Pablo Picasso "Buste de Femme" (Female Bust) that the Spanish artist never sold has been recovered by the so-called Indiana Jones of the art world, the Dutch art detective said on Tuesday. The painting was stolen from Abdul Mohsen Abdulmalik, a Saudi Sheikh, from one of his yachts in southwestern France on March 11, 1999, Efe news reported. "I am excited," Arthur Brand said. "We are talking about one the greatest artists of the 20th century and this was one of his most important works and his favourite because he didn't sign it and never wanted to sell it," Brand said. "He stored it in his house until he died," the art detective remarked. At the time of the theft, the painting was valued at four million euros ($4.5 million). French authorities archived the case and assumed it had been destroyed. "When a canvas disappears it is usually because thieves have been unable to sell it and choose to destroy it to avoid problems," Brand continued. The owner had offered a 400,000 euros reward to whoever retrieved the artwork. However, once he lost the hope of recovering it he made a claim to his insurance company which made him a four million euros payout. The artwork is an abstract portrait of Dora Maar, a French artist who was Picasso's lover, and is a good example of Picasso's cubism, an art movement the painter was at the forefront of. The Dora Maar has never been exhibited. The pair were a couple during the 1930s and Picasso painted the canvas a year after producing his most famous the "Guernica," (1937), an epic canvass of huge proportions that depicts the bombing of the eponymous Basque town during the Spanish civil war (1936-39). Despite assuming it was long lost, Brand had been searching for the stolen Dora Maar since 2015. When such a high profile artwork gets stolen there is, Brand said, a 10 per cent chance of it surviving, with it usually being handed over to an organised criminal group, often, to settle debts. According to Brand's investigative work, the Picasso canvas probably exchanged hands around 20 times. In 2015, the detective heard the painting was doing the rounds on the Amsterdam black market and that in 2002 it had been handed over as insurance to a mafia that trafficked weapons and drugs. Brand contacted both the French and Dutch authorities but because the case had been closed in France investigations did not progress any further. "Because there are so many stolen Picassos, I wasn't sure which one it might be and this was before the internet boom and it was difficult to keep up with the details," the art sleuth said. "I dug deeper and then knew which painting it was and how important it was for its painter," Brand continued. "When he died his family sold it to a dealer who then sold it to an Arab sheikh who kept it on his boat." Several weeks ago the investigator became aware that an art dealer had purchased the painting without any knowledge of what he was handling. When the new owner realised the painting could have been the long lost Picasso he reached out to try and pinpoint the origins of the work, somewhat cautiously as he was concerned of the legal implications of owning a stolen painting, if it indeed was proven to be so. "We knew he had nothing to do with the theft," the art expert said. "Launching an investigation did not make much sense, we would never get to the thieves because the canvass changed hands many times during this time. Thus, we reached a deal: he would hand over the painting to me and there would be no investigation." 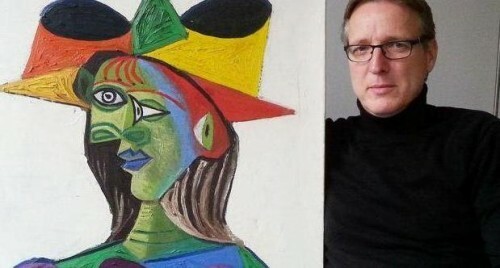 The Dutch art sleuth admired the colorful cubist portrait in his home on Monday, the day he recovered it, while he waited for the insurance company to come and collect it on Tuesday. The Picasso is now in the hands of Abdulmalik's insurance company's headquarters in Amsterdam. An American expert is analysing it to confirm the painting's attribution and assess the condition of the canvas before returning it to Abdulmalik. Once returned to its rightful owner, it is thought, the artwork would be valued at around 25 million euros if it were to be sold at auction. This is not the first high profile artwork brand has retrieved. Brand estimates the total value of cases solved by the Dutch art historian amounts to over 150 million euros, a statement on his website said.